French tosafist; died as a martyr in London Sept. 3, 1189. He was one of the most distinguished pupils of Rabbenu Tam, being often called by his teacher's name. According to "'Emeḳ ha-Baka" (ed. Cracow, p. 52), Jacob was still at Orleans in 1171, and went to London later, probably in response to a call as teacher from the community. He was killed during the anti-Jewish riots in London at the coronation of Richard I.
Jacob was a prominent tosafist, his tosafot being often quoted; e.g., in 'Ab. Zarah 34a; Giṭ. 8b; Ket. 47a; Men. 10b; Naz. 54b; Pes. 5b; Sanh. 35b; Zeb. 14b, 39a; Yeb. 4a; also in the old tosafot to Yoma 34a, 88a; in Judah of Paris' tosafot to Ber. 21b, etc. He also wrote glosses to the Pentateuch, which are included in Isaac ben Judah ha-Levi's "Pa'neaḥ Raza," and are mentioned even more frequently in Judah ben Eliezer's "Minḥat Yehudah." Jacob introduces a large number of gemaṭriot into these glosses. According to Gross, Jacob is also the author of the tosafot to Rashi's Pentateuch commentary which were written under the name of Rabbenu Tam, and which are mentioned by Geiger ("Parschandatha," p. 36). 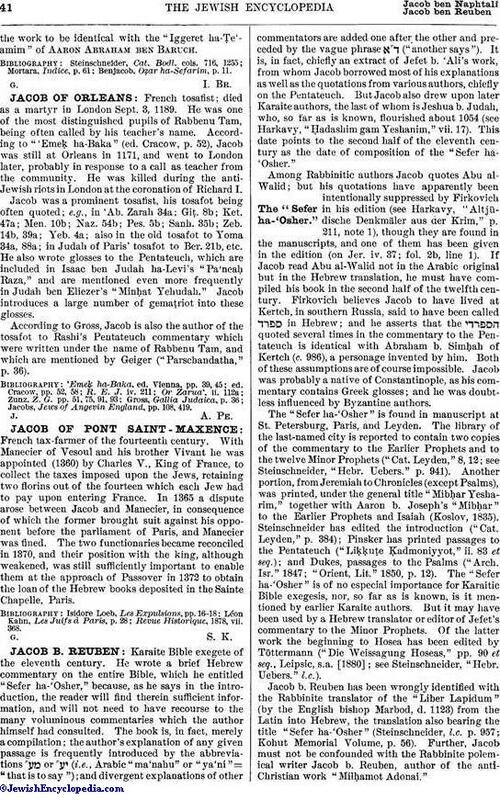 Jacobs, Jews of Angevin England, pp. 108, 419.